Today, my colleague Jim Caple ably lays out all the evidence explaining how closer is the most overrated position in sports. A few months from now, we may have another great example to add to his theory: Francisco Rodriguez's emergence as one of the favorites for the AL MVP award. Not many teams appear to be in the running to sign Francisco Rodriguez. Many media members, especially those in Orange County, have been happy to tout K-Rod's candidacy. • The Angels own the best record in baseball. • They have not one hitter with the kind of numbers that would make him an obvious MVP choice. • The Angels' starting rotation has gotten ace-caliber performances from three different pitchers: Ervin Santana, Joe Saunders and John Lackey. That's really confusing. • You can't vote for Grady Sizemore, Josh Hamilton, Ian Kinsler, Roy Halladay, Cliff Lee, Justin Duchscherer or a dozen other candidates with better numbers because their teams probably won't make the playoffs -- which, as everyone knows, makes those players' contributions completely irrelevant. • K-Rod has 45 saves, putting him on pace for 65, which would demolish Bobby Thigpen's single-season record of 57. That's a lot of saves. 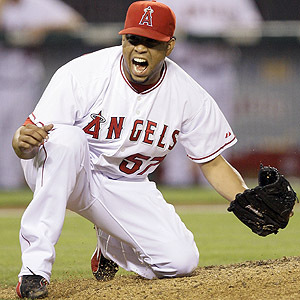 If the Angels finish with the best record in the league and K-Rod breaks Thigpen's saves record, the question then becomes: Why not give him the MVP? Let's start with opportunities. Through Monday, Rodriguez had 49 save chances this season. That's 13 more than the next-highest total in the league. (The Orioles' George Sherrill has 36.) If you get one-third more save chances than the No. 2 guy, let alone the average AL closer, of course you'll get a lot more saves. The Angels play more close games than anyone else in the league, which means they produce more opportunities for K-Rod. Of course, it's not Rodriguez's fault that his team has offered him so many save opportunities. In fact, K-Rod has done what appears to be an excellent job converting those save chances, saving 45 games in 49 tries. That's a 91.8 percent success rate. A 91.8 percent success rate seems to be really good. Let's see how good. I totaled the save opportunities of the current primary closers for each of the 14 AL teams through Monday. The lone exception was Detroit, where I only used the numbers of Todd Jones, who just lost his job, meaning we have little data to evaluate his replacements. Those closers have totaled 382 save opportunities. They've successfully saved 339 of those games. That's a success rate of 89 percent. Apply that average success rate of 89 percent to Rodriguez's 49 chances, and you get 43.6 saves. That's less than two fewer than K-Rod's current tally. This bears repeating. Take the average AL closer and give him as many save chances as Rodriguez, and there's a good chance he'll come through with 43 or 44 saves. So a typical closer might secure one or two fewer wins for the Angels than K-Rod has so far. One or two. And it's not a lock that those blown saves would result in losses either. The Angels are 22-13 in one-run games and 3-2 in extra innings this year. 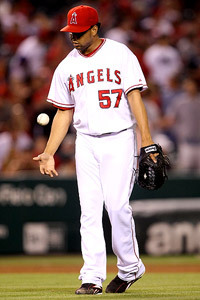 A blown save could mean merely that the other team ties the game; the Angels still could win it. That's the average closer. Now compare K-Rod's conversion rate to the rates of other elite closers in the league. The Royals' Joakim Soria has saved 32 games in 34 chances, earning him a 94 percent success rate. The Twins' Joe Nathan is at 30 for 32, also 94 percent. Then there's the Yankees' Mariano Rivera. The Yankees often play in blowouts, meaning they've produced only 26 save chances for their future Hall of Fame closer this year. But Rivera has converted all 26. If you're keeping score at home, that's a 100 percent success rate. That's just addressing the issue of saves. Closers can vary in their number of innings pitched. Some might come into a tie game or even occasionally with their teams behind, and a bad performance wouldn't result in a blown save. Innings pitched, hits, walks and runs allowed should be accounted for when comparing the value of one closer to another. In fact, we may be asking the wrong question here. Perhaps we shouldn't be asking whether K-Rod is the most valuable player in the American League. Here's the better question: Is K-Rod even the most valuable closer in the AL? Rodriguez has walked more batters, 28, than any other closer in the league. Boston's Jonathan Papelbon has stranded all eight of the baserunners he's inherited this season. Conversely, K-Rod hasn't pitched in the eighth inning this year even once. Meanwhile, Nathan, Soria, Rivera, Brandon Morrow, Papelbon and Bobby Jenks all have lower ERAs. Apply some more advanced metrics -- Value Over Replacement Player, Wins Over Replacement Player, Win Shares and Win Probability Added -- and K-Rod lags behind other closers, too. Nathan tops K-Rod in WPA; Nathan, Rivera and Soria, along with set-up men Scott Downs, J.P. Howell, Ron Mahay and Brad Ziegler, all beat K-Rod in VORP. K-Rod has allowed 28 walks this season, more than any other AL reliever. But even if we were to argue that someone other than K-Rod -- say, Rivera or Nathan -- is the best closer in the league, it's not as if those guys should be considered legitimate MVP candidates either. The save rule has made multimillionaires of many pitchers who are failed starters. That doesn't mean that what closers do has no value. It's just that we tend to exaggerate the value of a save. A pitcher can earn a save if he starts the ninth inning with the bases empty and his team up by three runs. We've already established that the average AL closer converts about nine of every 10 save chances. That success rate is even higher when there's a three-run margin to protect. At least when Goose Gossage and other ace relievers pitched 30 years ago, there was a good chance that we'd see the closer called on to get out of a bases-loaded spot in a tie game in the eighth or even the seventh inning. Now, on the rare occasion when a closer gets used for more than one inning, he's subject to endless second-guessing from talking heads. With such a cushy job, throwing just 60 or 70 innings a year to boot, no amount of adjusting for high-leverage situations will make a closer as valuable as a cleanup hitter who hits .320 with 40 homers, or a starting pitcher who throws 200-plus innings and allows fewer than three runs a game. Not even a closer who saves 60 games. There's compelling evidence that Francisco Rodriguez isn't doing much more than converting a couple more chances than the typical closer or seeing the same success rate as at least three or four other closers. Based on other metrics, you can make a good case he isn't even the best closer in the league. And even if he is the best closer in the league, his value still falls well short of the value of hitters such as Sizemore or Hamilton, and starting pitchers who throw three or four times more innings, such as Halladay or Lee. Or you could argue that Francisco Rodriguez was forged in the fires of Mount Clutch, sent to Anaheim on a winged horse to perform the kind of ninth-inning sorcery that no other mortal could ever hope to achieve. Jonah Keri is a regular contributor to Page 2 and the editor and co-author of "Baseball Between the Numbers". You can contact him at jonahkeri@gmail.com.